Tonight Meijer will publish their new ad for the next week but before that you can shop the products for the prices specified on the previous ad. Meijer Ad Oct 31 products are still available in stocks. You can view the full content of the old ads. Go to the preview page to see more offers. Let's pick the best products on the last ad to shop for the lowest values. For example buy 6 save $6 seems like a pretty good deal. Sale on meat products, simple packaged food offers are available on pg 4-5. FRESH FRUITS like seeded grapes, grapefruit, asparagus, tomatoes, tangerines, large avocados are featured on pg 6. Save more with the fresh food that is needed regularly. If you spend less in fresh products you can save much more than you imagine. Moreover winter wear for men, hunting equipment for professional inventory are stocked products for the given prices on pg 14&15. 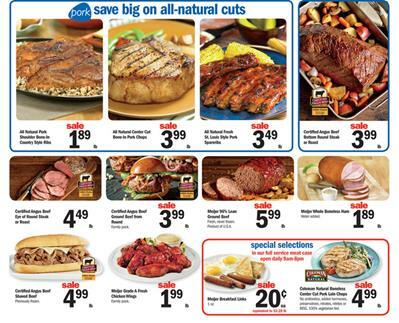 Learn latest prices of Kroger Ad for the meat and fresh food aisle. Almost full list of the products are listed on the pg 2-3 for the fresh grocery and meat. You may find out the best selection and lowest prices for Kroger if you like. Don't miss out anything from this beautiful range of products. Cool prices will make you happy. You will be shopping fresh fruits, veg, floral, organic choices, natural products from dairy aisle, deli and bakery products, randomly selected aisles best prices and some packaged seafood or meat products. 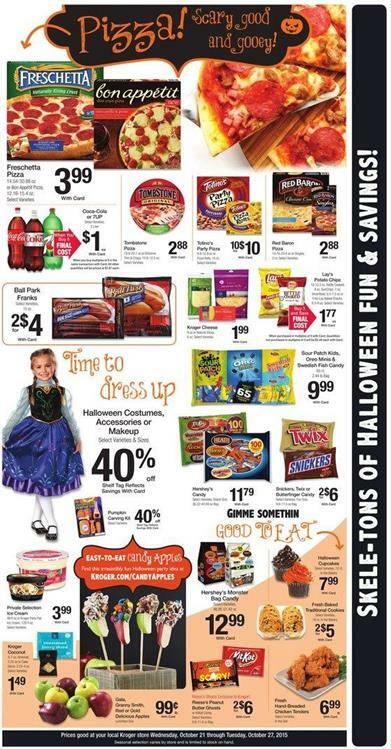 Ralphs Weekly Ad Oct 28 - Nov 3 current products are available in the link on the main page of the image. Click on the image to see more of the products of Ralphs. This retailer aims the best product to present in the ads. Latest Ralphs Ad offers favorite dairy and household products on the cover page. Price for Yoplait yogurt is only 10 for $5 today. Don Fransico's coffee 12 oz. is priced at $3.99 on the main page of the Ralphs Ad. Meat and some fresh food offers are also emphasized on the pg 1. VEGETABLE offers are also featured on the pg 2-3. For more Halloween and special products you can browse other ads. Almost all of the weekly ads have new products and prices for party. 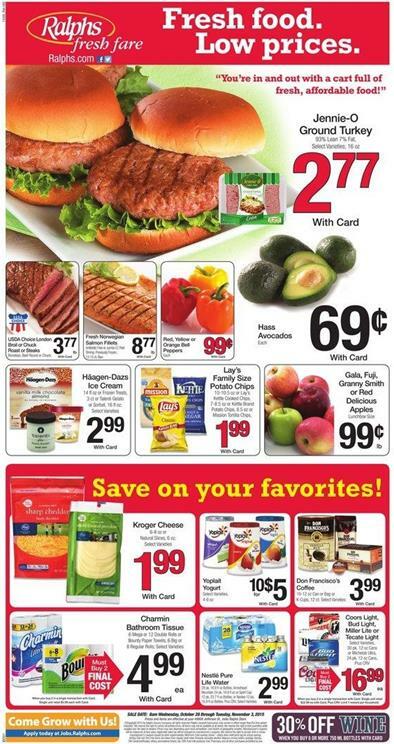 Meijer Weekly Ad Deals 25 Oct 2015 offers with the new product range contains buy 6 save $6 products that are lovely delicious. 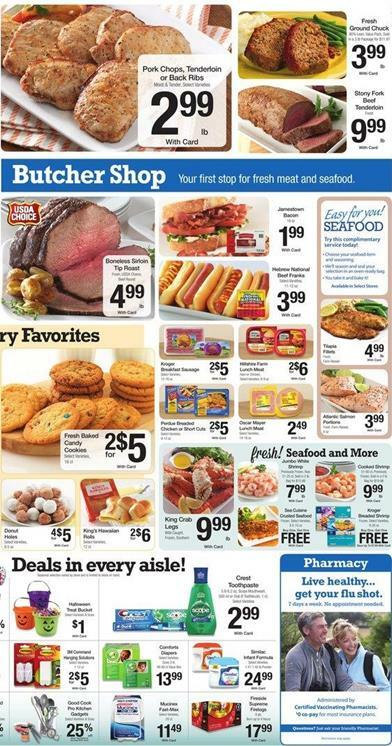 See packaged meat and seafood offers by Meijer Ad on pg 5. You can purchase these products today. You can prefer either online shop or the store. Besides fresh food at Meijer is unique. Fresh grocery offers of the retailer allows you to reach top quality products. Tropical fruits, natural vegetable and delicious packaged fruit salads are what they offer for the low prices. CANNED FOOD offers can be seen on pg 10-11. Household items like chemical cleaners, daily personal care products like Colgate toothbrush and toothpaste, Buy 3 save $3 sale are available on pg 6. And more Colgate products are featured on the same page. This section allows you to reach an ultimate range of products. Full content of the weekly ad of the Kroger can be seen.